T-Michael and Y. 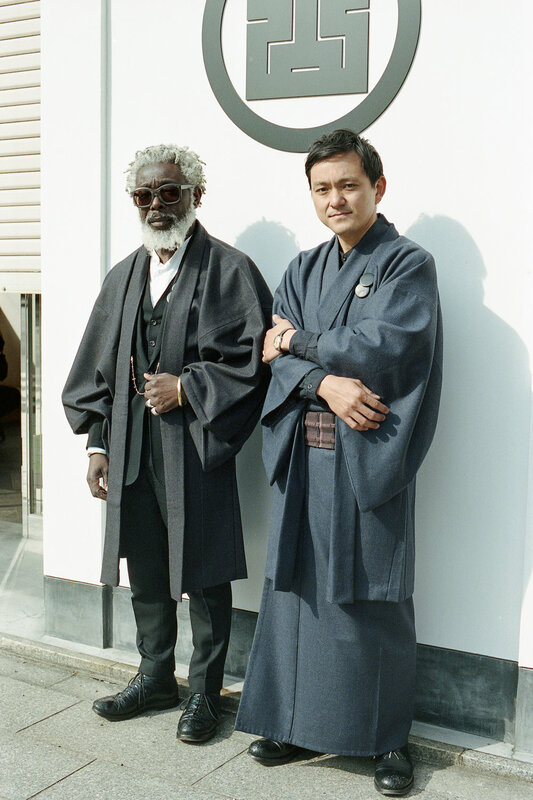 & Sons's common vision was to present the kimono as a new staple to men's wardrobe, side by side the suit or a pair jeans, as an everyday outfit and not just as a ceremonial garment. T-Michael designed the heavy wool flannel cloth with a mono stripe running through the entire length of the cloth. The cloth was woven at a mill just outside of Barcelona and shipped off to Niigata, Japan to be crafted at an artisan kimono studio where Y. & Sons hand tailors their kimonos. All of these combined elements celebrates rocksteady traditions but at the same time they also present T-Michael and Y. & Sons as purveyors of a contemporary mindset which is a representation of our current zeitgeist. On one of his trips to Tokyo Japan, T-Michael was introduced to Takayuki Yajima and Takatoshi Yajima at their beautiful store in Kanda, Tokyo. Y. & Sons is a well curated kimono shop catering for the contemporary man. The man with an acquired taste and appreciation for all things tradition and well crafted. The parent company Yamato Company was established in 1917 and has 123 stores all around Japan. So it's fair to say these people know their kimono! T-Michael fell in love with their approach to man's tailoring, which in their case was the Kimono and they fell in love with T-Michael's conceptual approach to men's tailoring. 3 years down the line, T-Michael and Y. & Sons present their first collaboration. The T-KIMONO. The T-KIMONO comprises of the Haori (the jacket) and the Kimono (the suit). The Kimono is traditionally tied with a sash called the Obi at the lower waist. The Haori is folded at the back of the neck and rolls nicely in place in front where it's held together by a Haori Himo. The Haori and the Kimono currently come in one size fits all and are recommended to be worn either tied, fastened or left to drape effortlessly along your body frame. T-Michael and Y. & Sons culturally walking you boldly into the future.